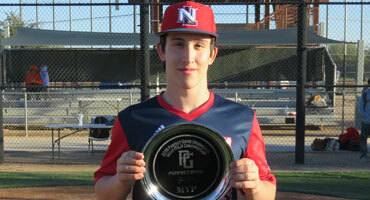 GLENDALE, Ariz. – By the end of the day, it was the new kid on the block who ended up owning the block at the Perfect Game Underclass West MLK Championship. No. 1-seeded New Level Prep put up six runs in the bottom of the first inning and had 11 on the board after four, and made that work in an 11-0, five-inning victory over No. 2 Dykstra Baseball 2021 in Monday afternoon’s championship game, played on the White Sox side of the Camelback Ranch spring training complex. 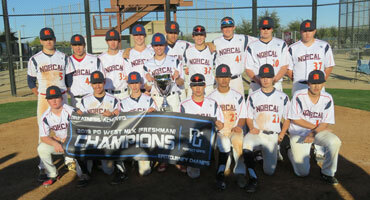 New Level Prep, based in Puyallup, Wash., finished 6-0-0 in its maiden Perfect Game tournament voyage. 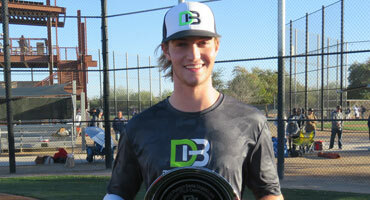 Dykstra Baseball, with its base of operations in Menifee, Calif., wound-up 5-1-0. The Preps came here with a roster full of prospects from the classes of 2020 and 2021 and all from the state of Washington. The Prep’s Jacob Yang led off the bottom of the first with a groundball single but the next two batters promptly lined-out and flew out to right field. At that point, the beleaguered Dykstra pitching staff fell on hard times, walking the next six batters, which resulted in four runs. New Level batted around and soon Yang was at the plate again; he reached on an error, which pushed two more runs across. Yang finished with a pair of singles, two RBI and two runs scored to lead New Level Prep; Zach Sharp tripled and also drove in two and scored two. 2020 right-hander Kyler Johnson started and worked 4 1/3 shutout innings, allowing three hits and striking out six without a walk. Dykstra Baseball 2021 totaled five hits; Ian Halverson doubled and singled and Andruw Householder contributed a pair of singles. 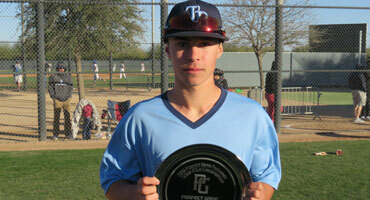 New Level’s Antonio Guerrerro, a 2021 third baseman from Fife, Wash., was 12-for-21 (.571) with a pair of doubles, a home run and three RBI and was named the Most Valuable Player. Dykstra 2020 right-hander Carson Hamro, a U. of San Diego commit from Vista, Calif., went 2-0 in 6 1/3 innings of work without giving up an earned run on seven hits while striking out 12, and was named the MV Pitcher. New Level Prep earned the No. 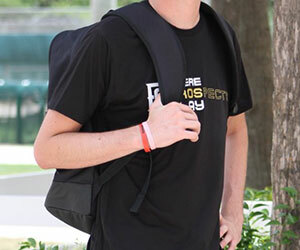 1 seed by outscoring its three pool-play opponents by a combined 17-2, and then beat the No. 8 Tri-State Arsenal Scout Team, 11-10, in the quarterfinals and No. 5 CCB Elite, 4-2, in the semis. Then it was off to the races in the title tilt. 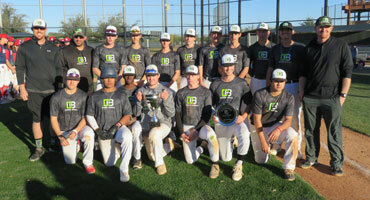 GLENDALE, Ariz. – North East Baseball National went into Monday’s championship game at the PG Upperclass West MLK Championship as the No. 1 seed after outscoring its three pool-play opponents by a combined 15-1. It beat No. 8 GBG NW Marucci, 9-1, in a Monday morning quarterfinal contest and then stopped the No. 5 Minnesota Blizzard Elite Black, 3-1, in the semis. As the Nationals made their way to the Dodgers side of the Camelback Ranch spring training complex for the championship game, they undoubtedly had to feel pretty good about their station in life. 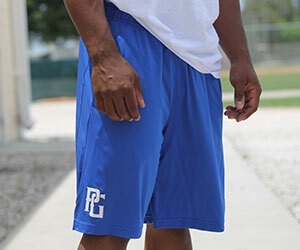 But there opponent in the finale was the talent-rich Sticks Baseball Academy, which was seeded No. 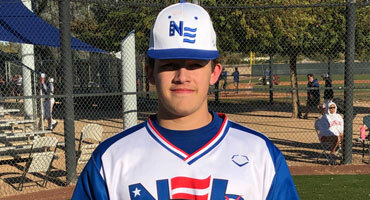 6 despite being regarded as one of the top outfits in the 34-team Upperclass field. The feeling around the complex was that this would be a dogfight, and no one was disappointed. 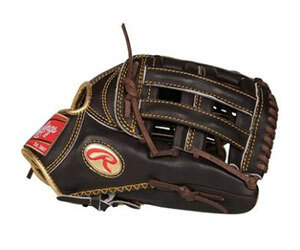 Both teams scored twice in their halves of the second inning, and it remained 2-2 heading into the bottom of the sixth. It was time for North East to take control. 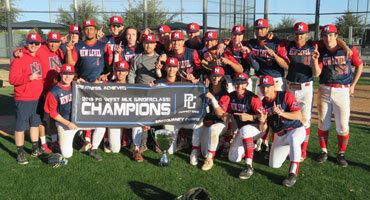 Kyle Casper came through with a one-out, bases loaded single that pushed all three runners across the plate and North East Baseball National escaped Sticks Baseball Academy, 5-2, to claim the program’s second Upperclass West MLK Championship title in the last three years. 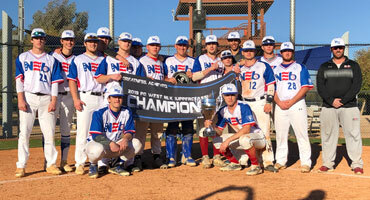 North East Baseball, a national program based in Hudson, Mass., finished 6-0-0 after winning three games on Monday. 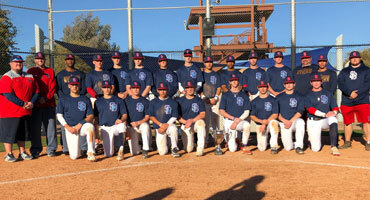 Sticks BA, an increasingly national program based in Little Rock, Ark., went home 5-1-0. The North East Nationals scored their five runs on five hits, with Troy Schreffler coming through with a double and a single and Patrick Roche contributing with a double; Casper finished with four RBI. North East 2021 right-hander Jack Cebert, 2019 lefty Jay Luikart and 2019 right-hander Caleb Thomason combined on a four-hitter and neither run allowed was earned; they struck-out nine and walked three. The Sticks used five pitchers who combined to surrender four earned runs on five hits while walking 11. No matter how its sliced, diced or broken down, 11 free passes are difficult to overcome. All four of their hits were singles and Blayne Robinson had one of them and drove in a run. 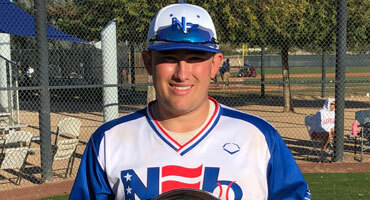 The National’s Michael Campagna, a 2019 top-500 catcher/third baseman and UC Irvine signee from La Jolla, Calif., was named the MV Player after going 6-for-13 (.462) with a double, triple, home run and nine RBI. 2019 right-hander Jackson Haga, a Liberty signee from Bowling Green, Ky., was named the MV Pitcher after throwing five, two-hit shutout innings with 12 strikeouts. 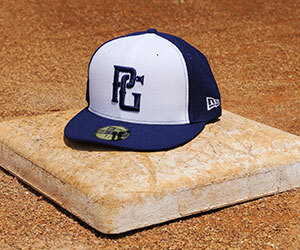 GLENDALE, Ariz. – Six teams advanced to the playoffs at the 24-team Freshman West MLK Championship, and because they allowed seven runs in their three pool-play victories, the NorCal Baseball 2022 Blue just snuck-in as the No. 5 seed. That meant that the 2022 Blue had to play in what amounted to a “play-in” game Sunday night along with the Nos. 3, 4 and 6 seeds to earn a spot in Monday’s semifinals against top-seeded Sticks Baseball Academy. NorCal rose to the challenge and beat No. 4 Pacific Northwest Regional Baseball Freshman Navy, 10-0, and lived to play another day. The NorCal 2022 Blue not only got past Sticks BA in the semis but it also topped the No. 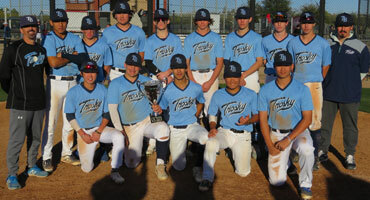 2 Trosky National Team, 8-4, in the championship game and took home the Freshman West MLK title Monday afternoon at the Camelback Ranch spring training complex. NorCal scored its eight runs on five hits while also taking advantage of the six walks it was issued. It led 5-2 after three innings, 5-3 after four and 8-4 after five, which is the way it ended. All five of the NorCal 2022 Blue’s hits were singles, and Wyatt King had two of them, Raoul Fabian, Malcolm Moore, Jaron Nevarez and Max Ortega drove in one run apiece; only three of NorCal’s eight runs were earned. 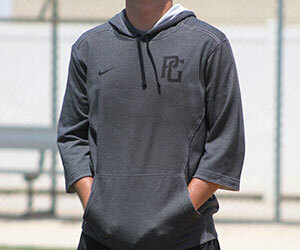 2022 left-hander William Wentworth gave up two earned runs on two hits and struck-out four in six innings of work; NorCal committed six errors. Trosky National collected just two hits, singles from Zachary Yorke and Ricky Rodenberg; the latter also drove in a run. 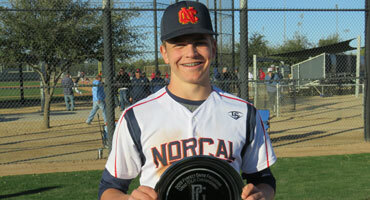 NorCal 2022 outfielder Robby Snelling from Reno, Nev., went 5-for-9 (.556) with a home run, three RBI and a .636 on-base percentage and was named the MVP. Trosky National 2022 right-hander Victor Heredia Jr. from Santa Ynez, Calif., went 2-0 in over 6 1/3 innings in two appearances without allowing an earned run on one hits while striking out 12 and walking one and was named the MV Pitcher. Bruno thought his team played an “unbelievable” game Monday morning when it got by No. 1-seeded Sticks Baseball Academy 1-0 in a semifinals. NorCal pitchers Neverez, Caden Thompson and Wentworth combined on the three-hit shutout, striking out eight and walking four. 2019 PG West Freshman MLK Championship MV-Pitcher: Victor Heredia Jr.